Wild, solitary-dwelling bees of Toronto create nests, manipulate pollen and hang out in the “Audio Bee Booth” and other amplified habitat structures. Macro video with micro audio! Created in co-ordination with the Toronto Zoo, CANPOLIN, and Laurence Packer’s wild bee lab (York University), 2010 – 2011.
to place each bitten green sheet. Her hind twitches like a frantic leaf. Serrated jaws quiver, and quiver. This energetic leafcutter bee (Megachile relativa) fashions oblong strips neatly cut from leaves into a brood cell where she will assemble a ball of pollen and lays a white, peanut-shaped egg. You can see her positioning leaf material like strips of wallpaper and chewing these along their edges with her serrated jaws (mandibles) so they stick better in place. Towards the end of the video she rejects a leaf strip for this brood cell. I named this bee Gracie because of her strange, skittish, almost ditzy habits. She’d leap from tunnel to tunnel, spin in circles, rub herself against walls, rush in with leaf parts only to reject them afterward. Am I anthropomorphizing? Yes. to next spring and solitude. Unlike Gracie, Mary Jane, a single mother from the species Hoplitis spoliata, looks like a total straight-arrow. She makes continuous back-and-forth trips to supply her growing brood. First we see Mary-Jane fashion chewed-up leaves into a bullet-shaped cell. Next we see her rolling pollen into a neat little ball, tamping it with her abdomen. This globe of protein-filled pollen is enough of a meal to take a brand new Hoplitis from larva to full-grown bee. seeps through walls like dark beer. Resin-collecting bees are late workers among bee-kind. They labour well past bedtime for most bees building solitary nest cells of sticky resin from nearby plants. This clip features two different bees in front and back of Sarah Peebles’ house. Olive uses resin that is nearly transparent while Olivia uses dark brown resin the shade of beer bottle glass. Their methods are the same as they create tiny, safe capsules for their offspring to grow in. 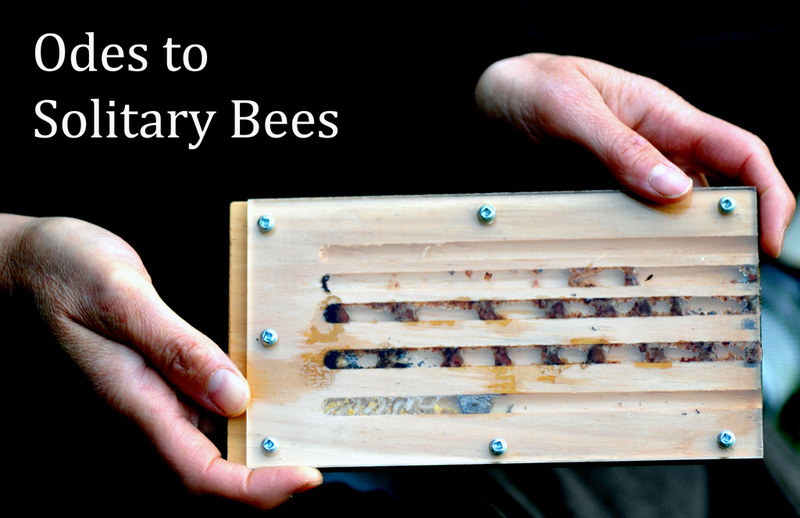 Full-sized bees will chew their way out the following spring. as he preens his sleekmetallic self. all below ground, forgetting him. Agepostemon viricens is one of the most good-looking bee species, and this male Agepostemon must know it, considering how much time he spends grooming himself. For the second time in Resonating Bodies history a male Agepostemon bee has dropped by one of our habitats to hang out. See last year’s video by Kevin Steele. 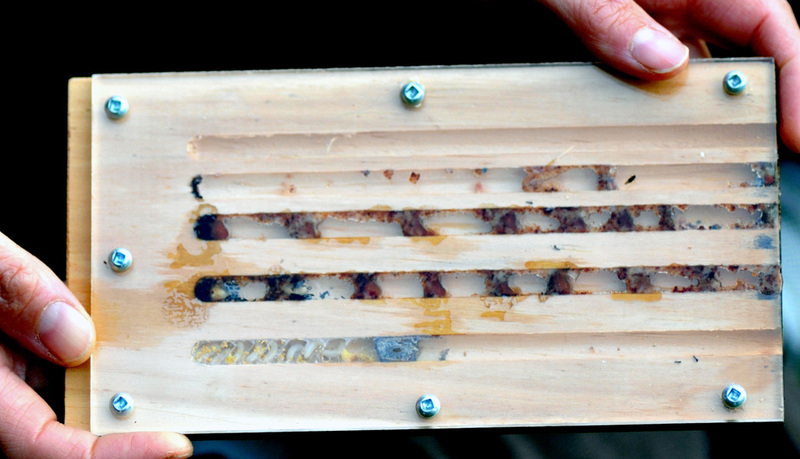 This little block of wood and plexiglas was a busy place for bees over the summer of 2010. Three upper rows contain the remnants of cells built of dark resin by yet another member of the species Megachile companularum. The row of transparent cells along the bottom row were made by the tiny, almost hairless masked (Hylaeus) bee. Mary-Jane, the Hoplitis bee also made an appearance. She built a single cell of masticated leaves. Her intention, it seems, was to block emerging Hylaeus brood from getting out. Hylaeus block Spring, 2011 (above). We can see that this block looks mostly the same as it did in the Fall, except that the very small Hylaeus (a/k/a masked bee) in the bottom bore have transformed from white larva to white pupa. With a magnifying lens we can see that they look exactly as adult bees, but opaque (select image to enlarge). We’ll soon have some time-lapse video from Packer lab student Veronica Ladico showing them darkening up and chewing out in the subsequent 10 days! 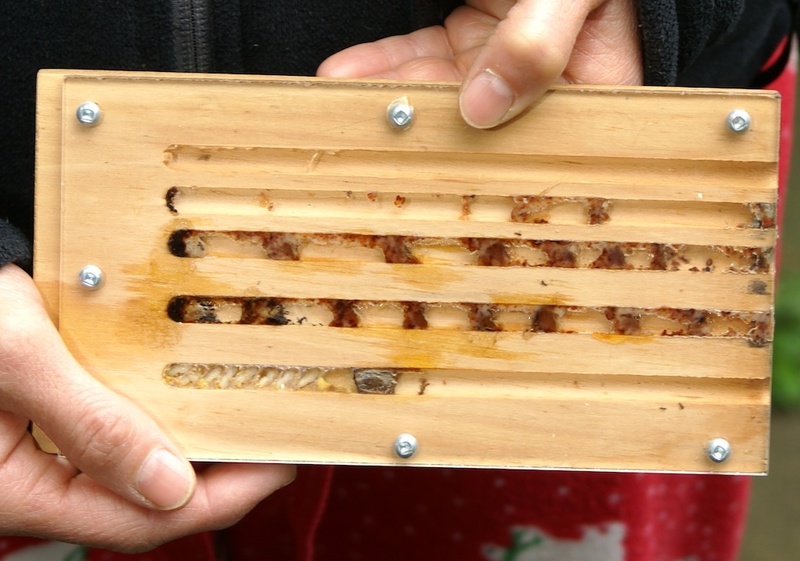 These bees are tiny – you can see a photo of some emerging from bamboo at Bee Biodiversity. We carefully poked a hole through Mary-Jane’s cell blocking the masked bees. Sadly, only about 3 of them emerged – the other 5 were found dead in the cell. A mystery. Macro video footage of various bee species’ nest-building activities will be examined by members of Laurence Packer’s wild bee lab at York University for a potential research paper. They will review video taken at Audio Bee Booths and blocks by Stephen Humphrey (Toronto locations and Kamisak Bee Lodge in Beaver Creek, Alberta, 2010, 2011); and video by Veronica Vladico from two of the booths in Ontario (2011, 2012). Some of the above videos were made at The Audio Bee Booth prototype, hosted by the Toronto Zoo Education Branch, Summer 2010.
plank fabricated John Kuisma; bee booth fabricated by Patrick Ellard. see Contents at the side bar to the right. Related videos are posted at the Resonating Bodies YouTube channel and on Vimeo. Stephen Humphrey thanks the Ontario Arts Council and Chalmers Foundation for their generous support.